"Meeseeks are not born into this world fumbling for meaning! We are created to serve a singular purpose for which we will go to any lengths to fulfill! Existence is pain to a Meeseeks. And we will do anything to alleviate that pain!" Some sort of vague homunculoid that seems to be pulled out of the aether, Mr. Meeseeks seems to disprove the notion that energy cannot be destroyed - for if a Mr. Meeseeks can be created out of literally nothing, then where is that building material coming from? And if its corporeal form ceases to exist when its task is complete, where does that material go? Splitting a single atom of matter creates enough energy to destroy a city; fissioning a creature the size of a full-grown adult would create an incomprehensible amount of energy, with a blast radius larger than our entire solar system. Oooo-weee! Mr. Meeseeks might be my favorite of the Funko Rick and Morty sculpts, coming in at an ideal 5" tall, exactly as expected for the 5" scale, looking nearly picture-perfect for his onscreen cartoon self. He captures the goofy overjoyed grin of the many Meeseeks we see in his episode, with his lanky limbs and hopeless optimism to assist. Look at me! It's a simple look but an effective one; in the previous reviews we've talked about how the gloss finish on these figures is sometimes an issue, but it is the absolute opposite here; Mr. Meeseeks has an excellent shine that looks exactly as I'd imagined in the show, and looks great mixing with other figures! As most of the figure is this one color, it doesn't suffer from the same paint slop as the others either. Win-win for Mr. Meeseeks! Hi! Look at me! Mr. Meeseeks shares the same articulation as the others in the line: balljointed neck, rotating hinge shoulders and legs, then pegs at the knees and elbows, and finally swivel joints at the wrists and feet. Again, the biggest problem here is that he lacks the extra joint at the top of his shoulder, which would give him the edge for poseability. Yessiree! Hey there! 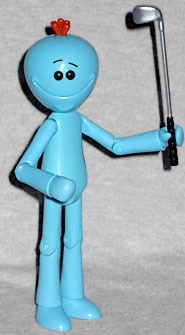 Accessory-wise, Mr. Meeseeks features two great episode-specific extras: the golf club he uses when he attempts to teach Jerry how to improve his golf game, and the pistol he uses after he fails to teach Jerry how to improve his golf game. 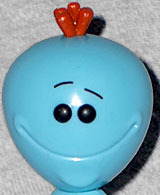 Mr. Meeseeks also features a Build-a-Figure piece for the Snowball figure included as an extra in this series of toys. Ooooh yeah, caaaaaaaan do!